I think I never really introduced myself on this blog . This is me 🙂 in Golden ,Colorado on a road trip . I usually work a little bit even if we are on the road . Stamping equipment is easy to take with you and easy to set up . My hubby was mountain biking for a couple of hours sohe dropped me off at one of the pars in Golden . I was born in the late 70’s in Leipzig , East Germany. When I turned 12, the Berlin Wall came down and a whole new world opened. I finished school in my home city and also went to Nursing school there. After moving to a different city in Germany, I met my husband of now 9 years on the internet, of all places. He is from New Jersey and we decided to move there. I am always up for an adventure so off we went. Because I was a nurse from a foreign country, it was not easy to get a license and work. I was prepared to go back to school all over again in the US to become a registered nurse. ( I had worked for 4 years in Germany as registered nurse ). My hubby “shopped” around and called almost every state in the USA to see where it would be easiest for me to find work without going back to school and, voila! New Mexico appeared on the radar. New Mexico accepted my translated license and gave me a brand spanking new one after I passed ( with flying colors ) my NCLEX (which is like the bar exam for a lawyer). 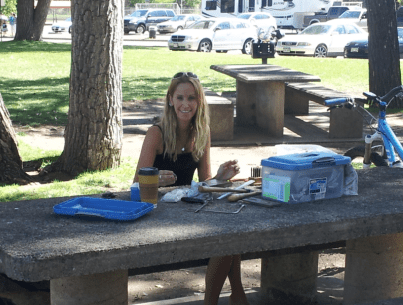 And then we moved again … to New Mexico….. I won’t bore you with my life too much. We came back in the summers to New Jersey to visit my in-laws and to have be closer to my parents in Germany. (Yes, I took the summers off.) I painted and went to a pottery class in 2008. Next to the building where the pottery classes were held was a small work shop occupied by a little old lady who was a Metalsmith. She made beautiful things in sterling silver and with sparkling gemstones and – lucky for me – she taught classes, too. That is when it began. She showed me how to make a ring and a bracelet from the beginning and how to handle a torch. Needless to say , I love fire! In short , I was hooked! I started out as a small hobby shop in the garage in our house in New Mexico making small pieces and selling them at the local farmers market. I did not sell a huge amount but it was fun and I met awesome, wonderful people and made a couple of friends. One of them introduced me to Etsy, and I opened my shop here in 2009. I was still working as a nurse at that point and saw the site as a nice venue to sell some of my work. Last year in September, my husband “took over” my shop (so to speak) and tried to make it nice for me. My native language is German and so my descriptions were not the best. “This is a sterling silver flower necklace ” – well, you get the picture. He took new photos and revamped my store, giving me a lot more time to create and make and build up my shop inventory. December of 2011 was the first month on Etsy where I could say, “Hey, this is a real business and I am making money. Maybe, just maybe, I could do this full- time.” I could and I did. In February of 2012, I made this my full time job. I also started making guitar picks out of sterling, aluminum, bronze and copper. Making them from scratch, starting with a blank sheet of metal, cutting the shape out, filing and deburring, stamping, patina and finally polishing the picks is gratifying, especially because I know people will cherish my little picks and play music with them.